Lord Carter has acknowledged that there is room for further debate before he publishes his final report on the future of digital communications in the UK. 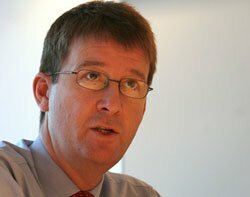 Carter, who is minister for communications, technology and broadcasting, announced the launch of the Digital Britain Review on 17 October 2008. The project is an attempt to secure the UK's place at the forefront of innovation, investment and quality in the digital and communications industries. The report set out 20 recommendations, such as the creation of next generation networks and universal access to broadband. Speaking at the National Endowment for Science, Technology and the Arts (Nesta), Carter said he was open to hearing more views on digital communications over the next few weeks, before the final report is published. At today's speech he spoke about the infrastructure requirements, the digital content that will sit on the infrastructure, and the protection of intellectual property and children. Questions put to Carter by the audience included how the government will ensure that the population understand how to use the media that will be made available to them and how the government will keep up to date with fast changing technology. Nesta has called for the government to deliver super-fast broadband access across the whole of the UK in the next five years and provide free basic broadband to the poor. It said the roll-out of super-fast broadband can be achieved at minimal cost to the public purse. Jonathan Kestenbaum, CEO at Nesta, said, "Today's event has highlighted both the challenges and opportunities of delivering a truly Digital Britain. The convergence of infrastructure, networks, telecommunications and content will be critical in driving forward the UK economy. As a country, we need to seize the moment and invest intelligently in universal access to superfast broadband if the UK is to take a lead in global markets."